To become a land-owner in Indonesia is a reasonably complex matter and it can be very time consuming, to find a reliable method to obtain ownership. Up until now, it is not allowed for foreigners to legally own a piece of land. The legal owner of the land will always have to be an Indonesian citizen. There are various legal constructions, based on splitting legal - and economic ownership, which makes it possible for foreigners to reliably invest in land and other property. After a thorough study of the various legal constructions and obtaining thorough legal advise, we ourselves have chosen for the following ownership construction, which is formally registered by a notary and will offer you full legal protection. The legal ownership of all plots of land of the Royal Residence Rangdu project lies with our Balinese partner and co-director, IG Bagus Surya. 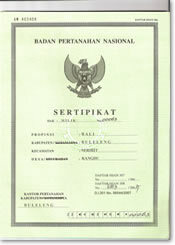 Indonesia uses a land register system, which is set-up similar to the Dutch land register system. There is a central register, in which land ownership is written down. The land registry office issues a sealed owner certificate to the name of the legal owner. An inheritable deed of partnership for an indefinite time period combined with a deed to transfer all competences will be established by a notary, by which the economic owner will receive all ownership rights (upon delivery of the villa). On top of this, as an extra security, we will give to your keeping this original and sealed proof of ownership. In this way, you can legitimately sell your property while on the other hand the legal owner can not do anything with the property without your consent or without the original proof of ownership. Your ownership of the property in this way will in practice be equivalent to legal ownership. In Indonesia there are various legal rights to land. The right of Hak Milik is the �eternal ownership'. This construction is what we use for our transactions. Besides this, Indonesia also uses various forms of user rights, which are known in The Netherlands as �long lease' and �lease' (like Hak Pakai, in which construction the land will be put on the name of the foreign owner), but this can only be done for a limited period of time (75-80 years), it also requires a long stay permit (KITAS) and is limited to a size of land of 20 are max. So only under certain circumstances Hak Pakai can offer an alternative for our partnership construction.